Are you a mom who feel like a homeschool failure? The role of Mom is often referred to as the hardest job in existence, but Homeschool Mom is probably the most difficult position of all. You don’t send your kids off to school each day where someone else is responsible for making sure they understand the new math lesson and master that difficult science experiment without blowing something up. All of these educational concerns fall on your shoulders in addition to the standard motherly concerns like discipline and moral guidance. There is tremendous pride and joy in teaching your children and spending every single day of their lives by their side, but there will always be bad days. Young children who are eager to learn will eventually turn into hormonal teenagers who want to hang out with friends rather than complete their schoolwork. Some young children aren’t self-guided, so they throw temper tantrums, ask questions nonstop or otherwise make your job as Mom/Teacher more difficult than you ever imagined possible. 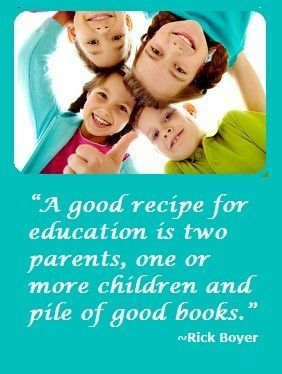 If there is one thing that can make a homeschool mom feel inadequate, it is reading homeschool mom blogs or spending time on Pinterest. We all do this because it is inspiring and informative at times, but it is also far too easy to compare yourself to the perfection reflected in many of these blogs. Many homeschool mom bloggers or pinners never mention that they are behind on laundry, their children eat meals from the freezer several nights a week, or that their kids aren’t always smiling beautifully as you see them in posted photos. They talk about spectacular projects that their brilliant children are completing, how their two-year-old is picking up his fourth language, and how their high school-aged child has already completed high school and has been accepted to Harvard already. It’s enough to make any mom feel inadequate, homeschooling or not. Rather than focusing on the image of perfection and feeling like a failure in comparison, think about those blogs in a different manner. 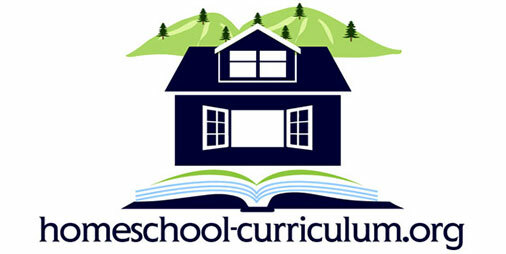 Think of them as small windows into the lives of other homeschooling families. You know that things can look one way through a window but the reality is quite different once you step beyond the window. You know that every family goes through difficult times and all children push boundaries, throw tantrums and occasionally refuse to clean their rooms or do their schoolwork. Some homeschool moms aren’t comfortable showing the full reality of homeschooling online, so you get the picture-perfect images and the daily rants of all the amazing things their brilliant children are accomplishing. Rest assured the bad days are there for every single one of these homeschool moms, even if they don’t want to put those moments in the window. You get the access to their lives that they are willing to allow, and that is all. When you start to feel overwhelmed or think you are failing your children, take a moment to list 10 things that make you proud. Your kindergartener may not be learning his second language, but he has mastered printing his name and is coloring in the lines. Perhaps your ADHD child will never self-guide in true “unschool” fashion, but he did sit long enough to do his math without throwing a temper tantrum or wadding up his paper today. You have to embrace the unique qualities of your family and remember the good when the bad days roll along. Take comfort in knowing even the seemingly perfect homeschool moms have their own dysfunction and their own bad days, but mostly focus on your own family. Give your children credit for their accomplishments, even if they don’t seem extra special in comparison to what other children are achieving. 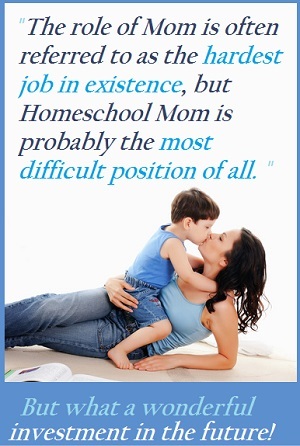 Homeschool Mom is the most difficult job in existence, and you willingly took it on out of love for your children. You deserve 10 minutes of alone time and a huge pat on the back. Your kids are really blessed to have you!